I just downloaded the new Custom Brushes. Just a couple of things. Do both the Dll file and the setup file have to be copied into the Effects folder? And also I noticed a download for brushes as well. Are these needed also or are they just extra ones if you want them? No. Either run the setup file or manually install the DLL. If you mean the link in the post, it's just a link to the normal brush-downloading thread. -New submenu only for CBM and an useless "Open brush folder" thing >> Useless. The "Open brush folder" should simply be a button in CBM itself. And maybe place CBM in your Tools menu ? -Would it be possible to add an option to place brushes in a column on the left (like olders versions) ? I don't like having a separate window :? For some reason you probably don't have the PDN registry key - if you have this problem just install manually. I should probably add a page to specify a path, though. If the button is in CBM, the user might think they can install brushes while CBM is open. 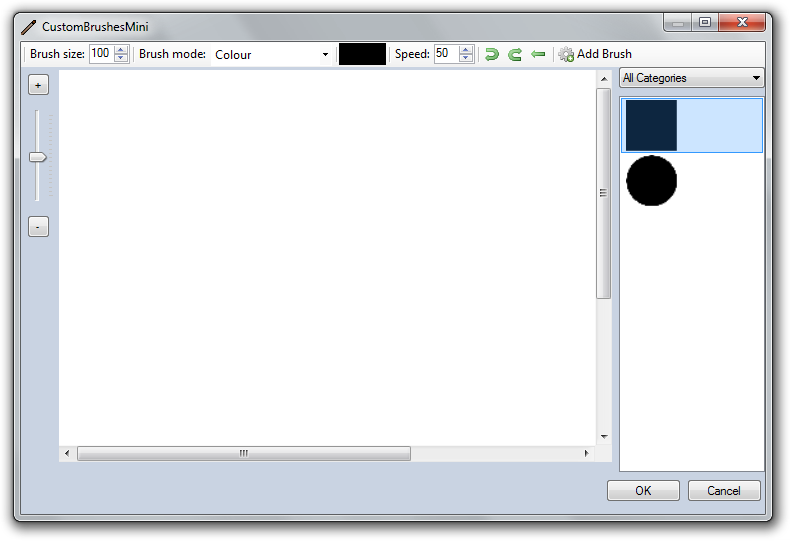 Also, i'm considering including a utility to just draw one of the installed brushes on the canvas. -I just installed the latest (1.0) CBM, and the first time I ran it it told me there was an update available. Then there was a plugin error. Did the plugin just refuse to open, PDN close without warning or it actually crash? The window was provided to give some extra space, but i'll consider putting it back. Can you remember when you downloaded the RC? Ah, I see the problem and i've fixed it for the next version. This time it simply says there's a problem with the plugin and offers to restard PDN. I'm such an idiot. I've added details of the now-public bug tracker into the first post. I was wondering... How do you create brush categories? Create subdirectories of your CustomBrushes folder with names beginning with underscores and put brushes in them. The subfolder should begin with an underscore. Seem to have a problem with the brushes...Or the plugin itself? Umm Everytime I load the brushes, the preview icons are so small I have to try them on to see which one I want. Is it just me or what? My actual brushes are quite big so I dont think thats the problem. Hi Simon, Thanks for a great plugin! I’m using IcoFX for editing .ico files. It has Blur Brush feature – it blurs pixels inside brush circle. I find it very handy. Is it possible to have such in Paint.NET? Great, although the only problem is sometime it bugs when I try to undo a past brush. After about 3 or so undo's it stops. Then resumes after a couple clicks. the link in the plugin itself doesn't work ..